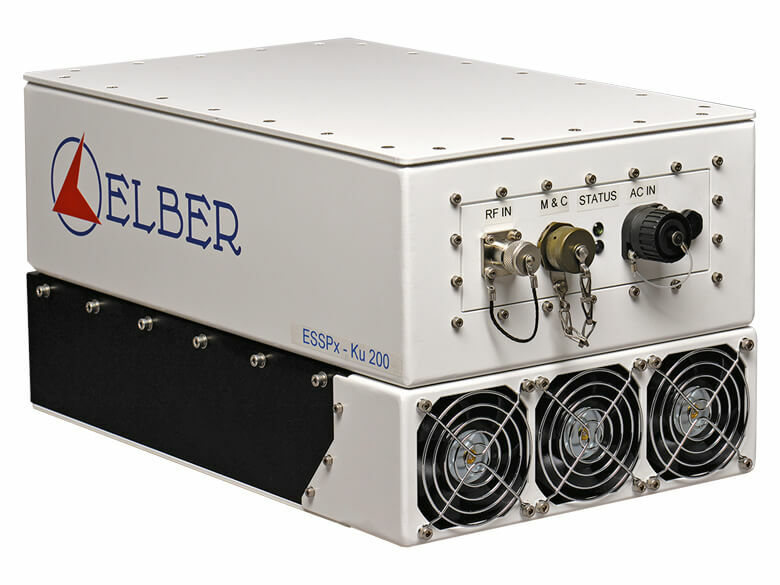 The ESSPx is the outdoor solid-state power amplifiers (SSPAs) series designed and manufactured by Elber with GaN transistor technology,with output power from 50W up to 200W. Available also as SSPB, with in-house designed upconverter, the ESSPA-Ku200 is the 200W Ku-band version. The ESSPx is an integrated unit, comprehensive of power supply and cooling system, housed in a weatherproof cabinet for safe outdoor installation and operation. Safe operation is preserved also through automatic software/hardware shutdown of final stages in case of overtemperature, over-current and high reflected power. The amplifier is equipped with precise forward and reflected power detection circuitry for correct configuration and monitoring of the amplifier. can be easily replicated for massive production. and remotely through serial Ethernet connection. management of 1:1 solution or optionally with external Master control unit, through Cleber platform (one control unit for 2 amplifiers). Fully protected against over-temperature, overcurrent and high VSWR.